The BTEC Higher National Diploma in Performing Arts is designed for learners aged 16+ who wish to pursue a vocationally relevant qualification in the performing arts sector. 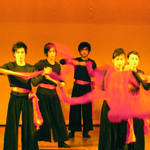 The BTEC HND in Performing Arts covers a many areas of the Performing Arts industry. Students engage in a variety of learning experiences from strands including Acting, Dance, Musical Theatre, Costume, Makeup, Set Construction, Stage Design, Stage Management, Theatre Technology, Arts Management, Performance, Design, Technical and Production. Students also complete a large scale real-life project, and have many opportunities to present their creative work to the public. Students who complete the Diploma in Performing Arts course are eligible to directly enrol in this program. Students graduating from this program can apply to a variety of universities and colleges that accept the HND as equivalent to part of undergraduate study.The HKCAC can provide a list of tertiary institutes who welcome CAC graduates. This course is available to both local and overseas students.This course is available full-time (2 years) and part-time (3-5 years). For admission into this program applicants must obtain a pass in the Hong Kong Communication Art Center entrance interview. This interview determines the applicant suitability to demonstrate enthusiasm and potential to succeed in the program.Mature aged students of at least age 21 are welcome to apply. Demonstrated ability and previous experience can be considered in lieu of Form Five graduation.